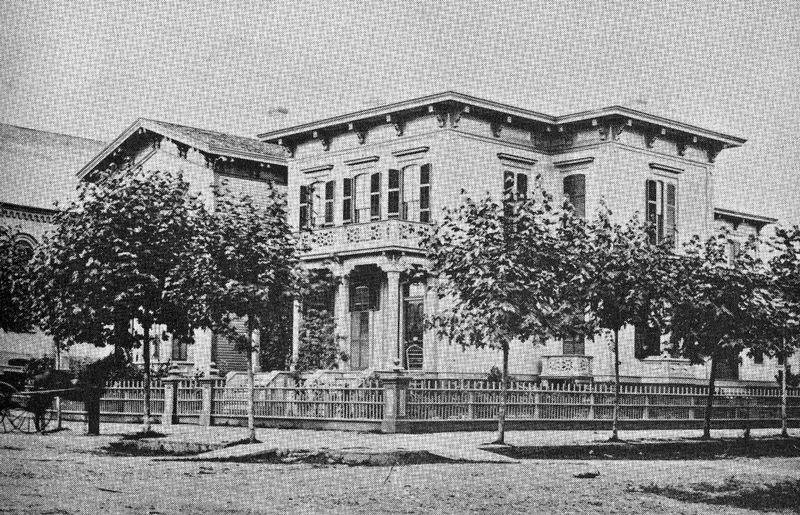 The Glisan / Holladay house on the south west corner of Third and Stark. "After buying a large home from Doctor Rodney Glisan, "he remodeled it and immediately installed a harem of high class prostitutes." The statement plays into the well established narrative of Ben Holladay's sojourn in Portland, and notions of a raucous frontier of painted ladies and soiled doves. Often repeated, the anecdote has acquired the authority of settled fact. A close examination of the story however reveals a different picture; a cautionary tale of how myths perpetuate and history is made. "He was a man of splendid physique, fine address, and knew well how to manage the average human nature. He was energetic, untiring, unconscionable, unscrupulous, and wholly destitute of fixed principles of honesty, morality and common decency." -Joseph Gaston in Portland Oregon, Its History and Builders (1911). Much of what has been passed down about Holladay's time in Oregon has come from the works of historian Joseph Gaston, whose poisoned penned invective was anything but impartial. The root of his animosity dates to the situation in Portland in April 1868, when two railroad companies, each with the name Oregon Central, began building to reach California and the lucrative Federal land grants to be awarded to the first company to complete twenty miles of track. 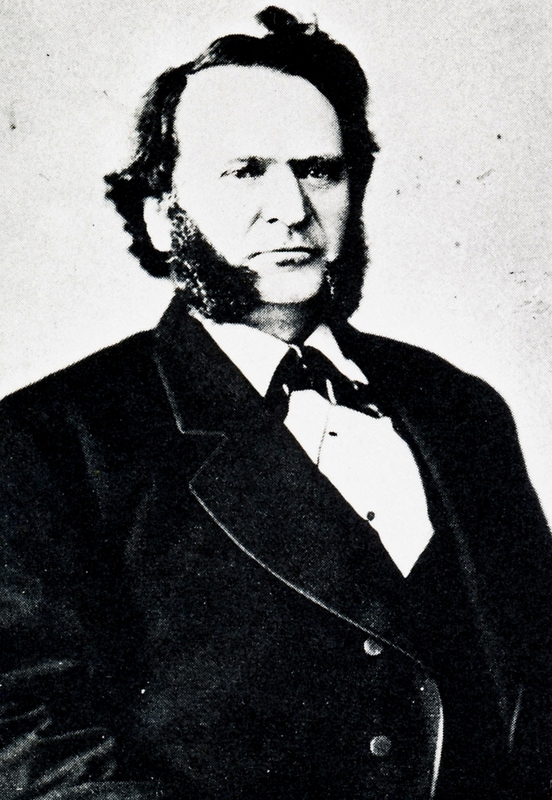 Joseph Gaston was president of the Oregon Central (West Side). He was backed by wealthy Portland interests that included John C. Ainsworth of the Oregon Steam Navigation Company and banker William S. Ladd. Their chosen route to the Golden State was via Hillsboro and Corvallis. With an eye for the grand sweep of history, Gaston envisioned his railroad leading to the rise of a Portland, that: "...holding the keys and being the gateway and handmaid to commerce between the Atlantic and the Indies, shall rival Venice in its adornment and Constantinople in its wealth." The Oregon Central (East Side) had dubious origins in San Francisco. It started building in East Portland and was backed largely by down state and Salem interests who stood to gain a railroad by its route. The Salem group had the easier to build alignment. They hired Chinese labor (who knew something about building railroads) "rows upon rows of them" (the actual number at the time of the quote was around forty). The Portland (or what Gaston would call, the Gaston) group had the route more likely to be profitable upon completion of its first twenty miles. They avoided hiring Chinese workers, a fact they stated with pride. Finances and geography considered, the two camps were evenly matched - until the arrival of Ben Holladay in August 1868. Portland at the start of the 1870s. Note the railroad on the east side of the river. Holladay had made fortunes in the stagecoach, steamboat and steamship businesses and was looking to make another with railroads. He acquired the east-side company and reorganized it as the Oregon & California Railroad. 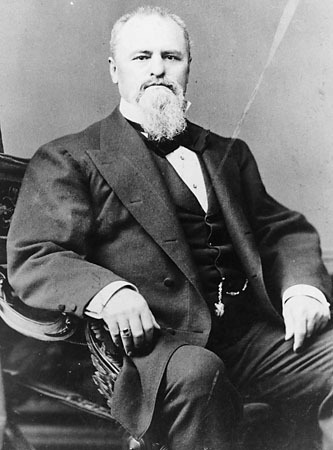 A master of Gilded Age lobbying, he dispatched one of his steamboats to Salem for use as a veritable pleasure barge to influence the Oregon legislature. Money, alcohol and favors were liberally applied to the task at hand. He then rammed through the construction of the railroad to win the offered Federal land grants: today's O&C timber lands. Out played, out spent and out built, the Portland group decided to reach accommodation with Holladay, to wait, as W.S. Ladd put it, until he hung himself financially. In an exchange of letters between John C. Ainsworth and Ben Holladay, Joseph Gaston's dream was sold out from under him. "But it is all past into history. All the actors in the drama are dead but one. All the members of all the old companies are dead but this one. And while he was robbed of his rights and his property by a corrupted legislature, and corrupt judges, he still remains to enjoy in comfort a pleasant home that looks down on the city he has helped build, with all the necessary comforts in life; and what is better than all else, the respect of his friends and neighbors -and lives to write this history of those who wantonly robbed him, and gained nothing in the end by their wrong doing." 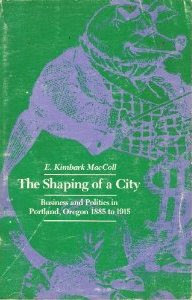 -Joseph Gaston, Portland Oregon, Its History and Builders (1911). "When he bought one of Portland's largest homes from the city's most prominent physician, Dr. Rodney Glisan, he remodeled it and immediately installed a harem of high class prostitutes." 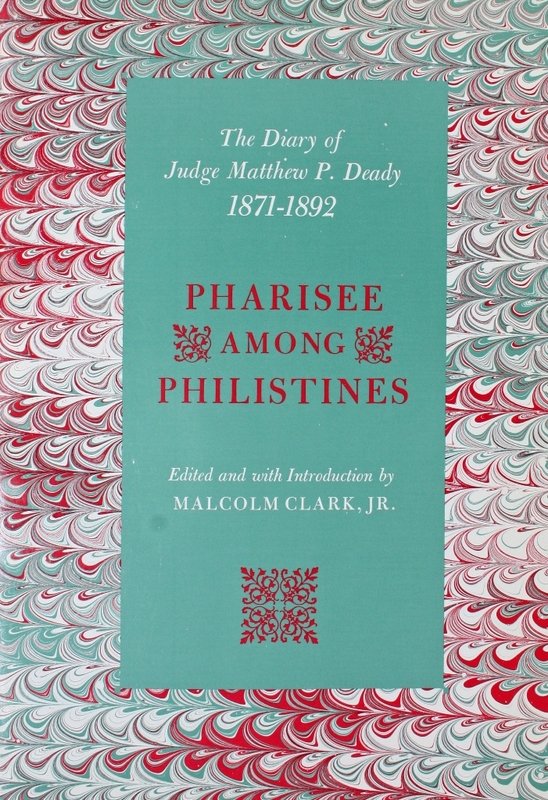 The source MacColl referred to the diaries of Judge Matthew P. Deady, later published as Pharisee Among Philistines (1975). 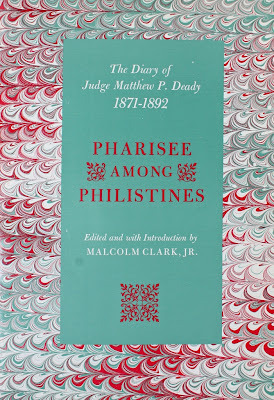 The entry MacColl specifically cited was from March 8 1872, where Deady described a confrontation between James A Nesmith and Ben Holladay, related to him by Nesmith. 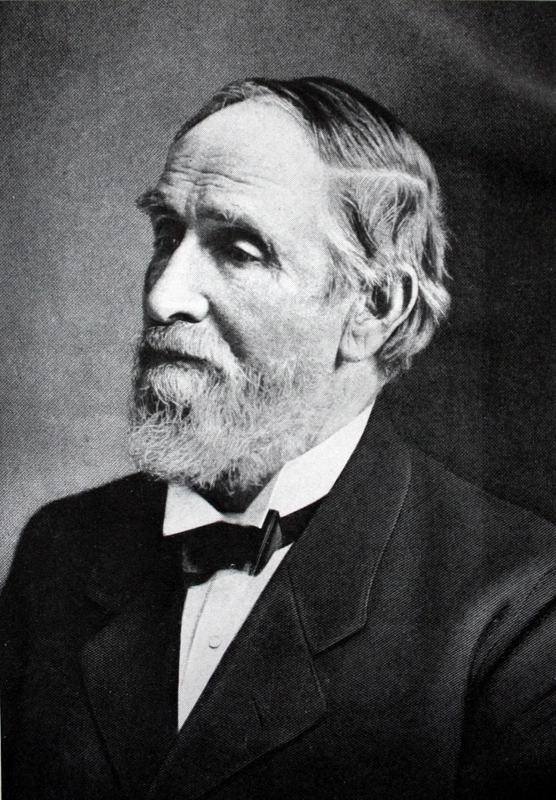 James Nesmith (1820-1885) pioneer, congressman, and raconteur. He was the originator and thus far, only source of the story that Portland co-founder William Overton was later hanged in Texas. "He said that H (Holladay) was bantering him about running for Congress and advising him to keep out of politics and threatened to put a man on his track who knew all about him if he did. Nes asked who it was and H finally said it was O'Meara. Nes replied that if any man set his dog on him, he would not stop to kick the dog, but would go after his master, and if you -H set your dog on me I'll get up on the stump and tell the people of Oregon, that Ben H keeps two whores in Portland, O'Meara and the other one and I'll tell the name of the other one -meaning of course Miss E.C." "O'Meara" was James O'Meara, editor of Ben Holladay's Portland paper, the Daily Bulletin. 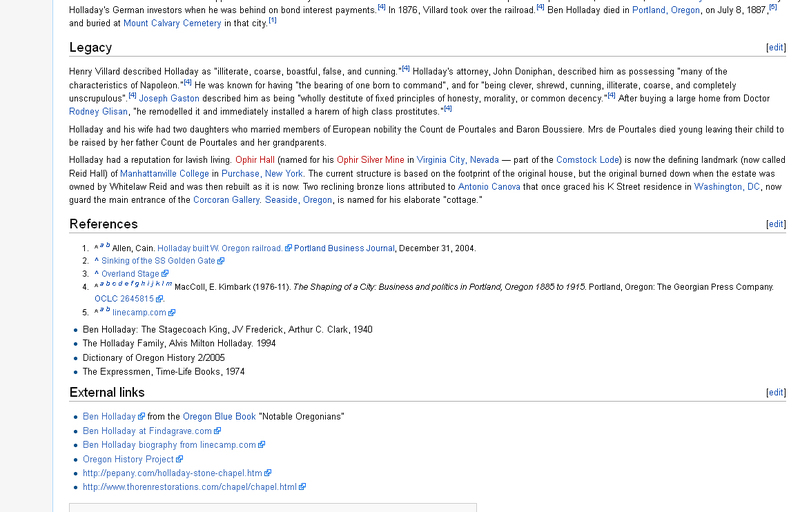 He had been on good terms with Matthew Deady before falling out with him over the Wallamet / Willamette controversy. If O'Meara was one half of whom MacColl would refer to as "a harem of high class prostitutes" who then was "Miss E.C."? -Courtesy of the Oregon Historical Society, OrHi #12167. 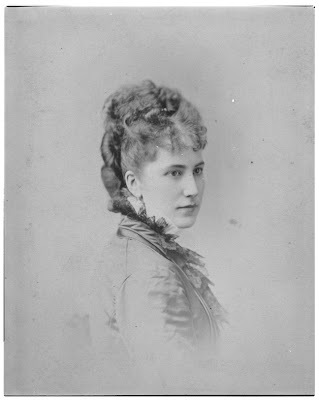 Esther Campbell was the daughter of pioneers, Hamilton Campbell and Harriet Biddle, who arrived in Oregon in 1840 on the ship Lausanne to join Jason Lee's mission. They had six daughters and two sons. Hamilton Campbell was an artisan who was to engrave the dies used to coin the territory's first currency, the locally minted so-called "beaver money." He became a daguerreotypist and established a photography business in Corvallis, and later, San Francisco. He went to Mexico in 1862 to become the Superintendent of Mines in Guaymas, where he was murdered the following year. 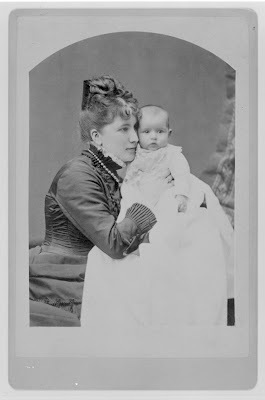 According to the Portland City Directory of 1868, the year Holladay arrived in Portland, Harriet Biddle Campell lived on Washington Street between Third and 4th, likely with her family which included her nineteen year old daughter Esther. By the time of Deady's diary entries (1872) Esther was the constant companion of Ben Holladay. The specifics are lost but the equation is familiar to any reader of Edith Wharton or Henry James: a unhappily married tycoon, an absent wife, a prominent family in hard times, a beautiful daughter, a scandal. 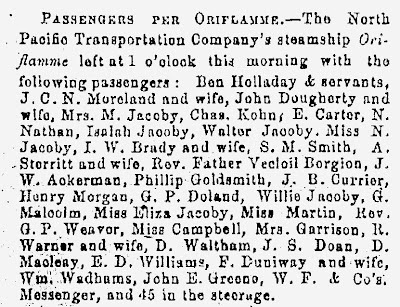 Ben Holladay departs Portland for San Francisco on his steamship, the Oriflamme, in a notice from the Morning Oregonian, January 20 1872. Miss Campbell is further down the list. 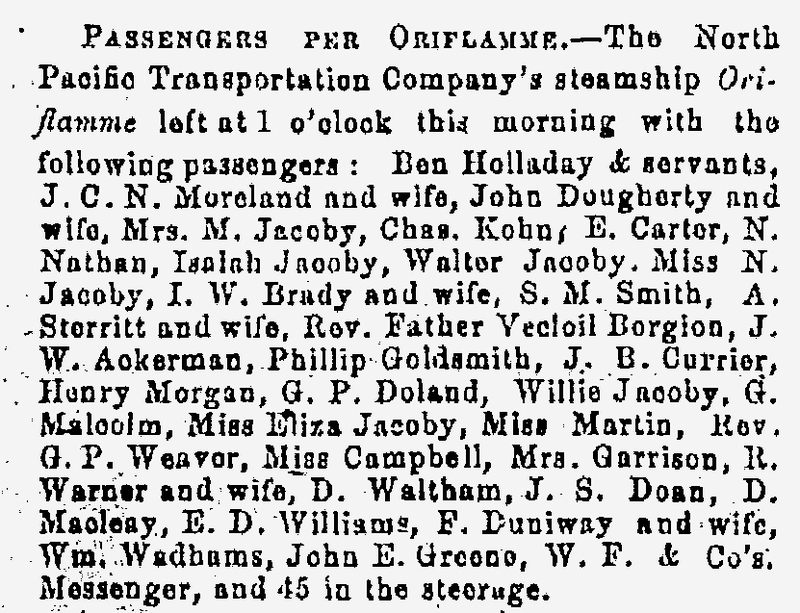 Two months later, the Morning Oregonian of March 7 1872 announced his return from San Francisco on the Oriflamme. A Miss E. Campbell appeared on that list. "...The Oriflamme came back in yesterday afternoon, bringing Holladay and Household back to Portland." - entry from Matthew Deady's diary, March 7 1872. 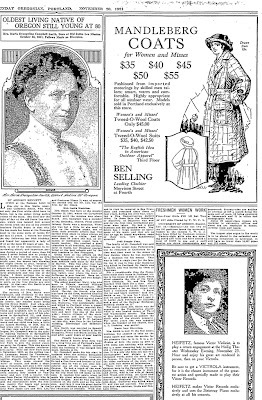 "Reed called and said the had a story at Baker City that young Ben (Holladay) went below (to San Francisco) at met his mother about to come up to Oregon, and he told her not to go, she was too old to go into a whore house." "Young Ben" Holladay was the son of Ben Holladay and his first wife Ann, who was visiting San Francisco from her home in upstate New York. MacColl summarized the entry as to mean that "Holladay was running a whore house in his own home." A more likely interpretation is that the anecdote reflects the rocky relationship between Holladay and his alcohol-troubled son, and the son's feeling about his fathers relationship with another woman. Deady was an occasional guest at Holladay's where he was to enjoy dinners and "some white wine said to have cost in New York $63 a dozen." It is hard to imagine the upright judge would be seen entering a house he actually suspected of being a brothel. More probable was Deady's interest in how Holladay's domestic scandal was played out publicly. Esther Campbell Holladay and daughter, Linda Holladay. -Courtesy of the Oregon Historical Society, OrHi #100106. 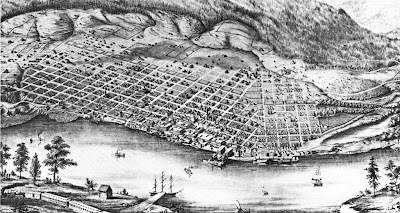 Ann Holladay died September 18 1873, three months after her visit to San Francisco, at the same time Ben Holladay's fortune was collapsing in a financial panic. A year later, Ben Holladay and Esther Campbell married. They had two children together, a son, Ben Campbell Holladay, and a daughter, Linda. They lived at the house on Third and Stark as Holladay tried unsuccessfully to return to riches. He died in 1887, Esther died two years later. They are buried together in Portland's Mt. Calvary cemetery. 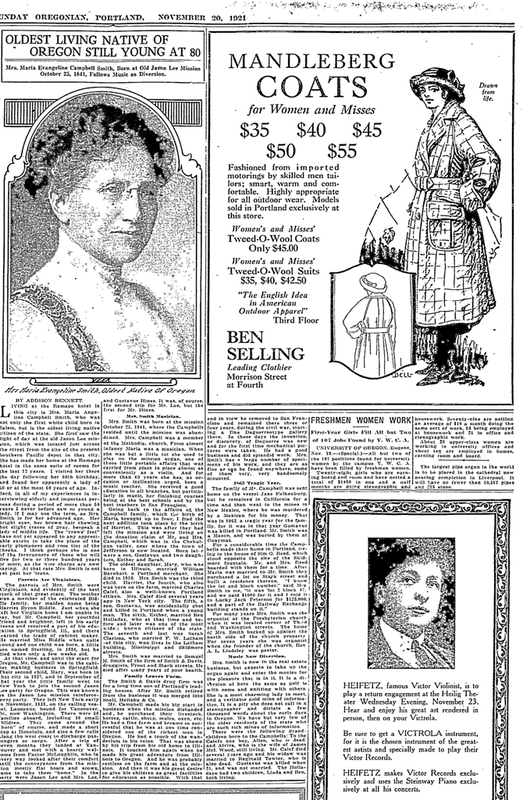 -The Sunday Oregonian, November 20 1921. An article in the Sunday Oregonian, written forty-three years after Ben Holladay's death, brings the house at Third and Stark and its surroundings into sharper focus. It celebrates the eightieth year of Maria Evangeline Campbell Smith, one of Esther's older sisters. In it she describes her long time home on lot #2 of block #47, on Third Street between Stark and Washington, and her years spent as the organist at the church that neighbored her house to the south. Third and Stark (the present site of Huber's). 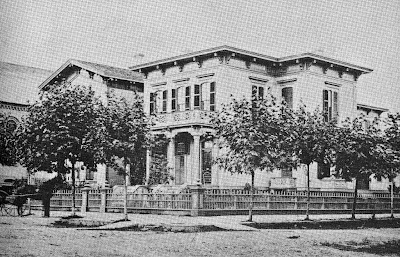 The article, combined with city directories and other sources provides a view of the house at Third and Stark, not as a high class brothel, but as part of what was practically a Holladay-Campbell compound. Directly behind Holladay's house, out of view in the picture, lived his ne'er-do-well brother Joseph. The house to left of Holladay's belonged to Maria Campbell Smith and her husband, prominent druggist Samuel Smith. Partially visible is the Presbyterian Church where she was the organist. To the rear the church, or directly across the street from it on Washington, lived Harriet Biddle Campbell, Maria and Esther's mother, likely with their youngest sister, Harriet, who would eventually marry R.H. Towler, Ben Holladay's personal secretary. To the photographer's back was the Catholic Cathedral (today, the Bishop's House is a remnant) on the north east corner of Third and Stark, to which Holladay, a Catholic, donated a stained glass window in his and Esther's name. 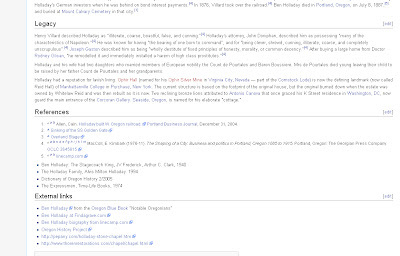 from the Oregonian the relatively free pass granted to the later financial over-extensions of Henry Villard or George B. Markle. Joseph Gaston's views, dominant now into the age of Wikipedia, provided the fertile ground for Kimbark MacColl's erroneous interpretation of, if not scandal, then the wrong scandal. A closer look at history, and the circumstances of its writing, asks for a more nuanced approach. ..more to follow in The Fall of the House of Holladay. Keep up the good work, I always love to see legends upended (often times the truth is so much more interesting anyway). Can you tell me about the perspective drawing of PDX in the 1870's? Who was the artist? The grid shift and depiction of the west hills is wonderful. Who has the original? Thank you for posting these, the progression of development is always fascinating.